Hot Dayum! It's that time again! Yes folks... That once a year gathering of some of the BEST in the conjure biz. Registration is now open and the pricing simply cannot be beat! 2 Fun Filled days of non stop "Hoodoo Higher Learning". This is where the "Spiritual Elite" come to teach, commune, and have fun! There will be a bevy of talented readers on site to give you answers to your life's questions, as well as the Lucky Mojo Curio Co. store for you to shop at in between or after classes. This is definitely a weekend NOT to miss! January 14,2014 was the day the world lost one of the most extraordinary people I have had the honor of knowing; Dr. E.
Someone recently described him as that likened to a Diamond. Full of many different facets, and I couldn't agree more! His talents spanned farther than just a Conjure Doctor... He was a Priest of Shango, Leader of a group of men called The Unnamed Path, a reader of the Diloggún, an Artist (in every area of his life), activist for what he felt was Right and True. Dr. E did for them. A scholar in every sense of the word... The man was a brain on legs. Once again, there really wasn't much that he did not know. He could have ruled the world. Heavy hearts gathered today to pay their respects, share their love and memories of Dr. E, to say their final "farewell's" at Magnolia Memorial Park in Garden Grove, Ca. where he is laid to rest amongst other members of his family. I personally could not be in attendance, however a floral arrangement with a note of heartfelt sympathy will be delivered in my place. I was lucky to have been sent this video that was shown at Dr. E's services today. As only Eddy knew how to make an entrance, he arrived in this world on January 1, 1976: the first day of the Bicentennial Year. Eddy was the younger child of Manuel Gutierrez and Vicky Sirgo Gutierrez, who migrated from Cuba in the sixties. He was an inquisitive child, who taught himself how to read from a set of Childcraft Encyclopedias, that Vicky had given him as a gift. When he ran out of encyclopedias to read, he read the Bible. Eddy had a special smile, which in Spanish is called “picaro” – a kind of warm, open smile that can also be mischievous. And Eddy was always up to something. He adored his older sister, MaryAnn, and sometimes, that extended to sharing in mischief. When the two got into trouble, they both ended up being sent to their rooms — at the same time. At other times, he was helpful to his sister. When she started college, and was complaining about some geology homework that she and her friend Alex had to do, Eddy — who was only 13 at the time — patiently sat down and went over the lesson with both of them until they understood it, even though he’d never studied college-level geology before. Eddy was a gifted student, and held Honor Roll status throughout his school years. He had a strong, beautiful Baritone voice, and was a member of his high school Chamber Singers and theater group. His gift for speaking followed him through Debate Club, Toastmasters, and the Honor Society. Eddy graduated from high school with high honors, and received a full scholarship to UC Riverside, where he took science courses. He intended to become a medical researcher, to find the cure for the Alzheimer’s disease that had claimed his grandmother. Eddy loved science and technology. But he also loved art, and gardening. He collected and grew bonsai trees; he loved to cook, and made the best ice cream. When Eddy’s grandmother passed away, he worried that nobody else in the family knew how to knit and crochet like she had. As he felt it was important to carry on the tradition, he taught himself how, and his first creation ended up being a full-sized crocheted bedspread, with a very intricate pattern that amazed everyone who saw it. Anything that Eddy put his mind to, he would learn. Eventually his school interests shifted. He had always been a talented artist, so he gained formal training and eventually a Master of Fine Arts in Graphic Design from Cal State Fullerton. Eddy then went to work in the IT and graphic design field, and was the Art Director of a large commercial advertising agency in Southern California until he began his own business. 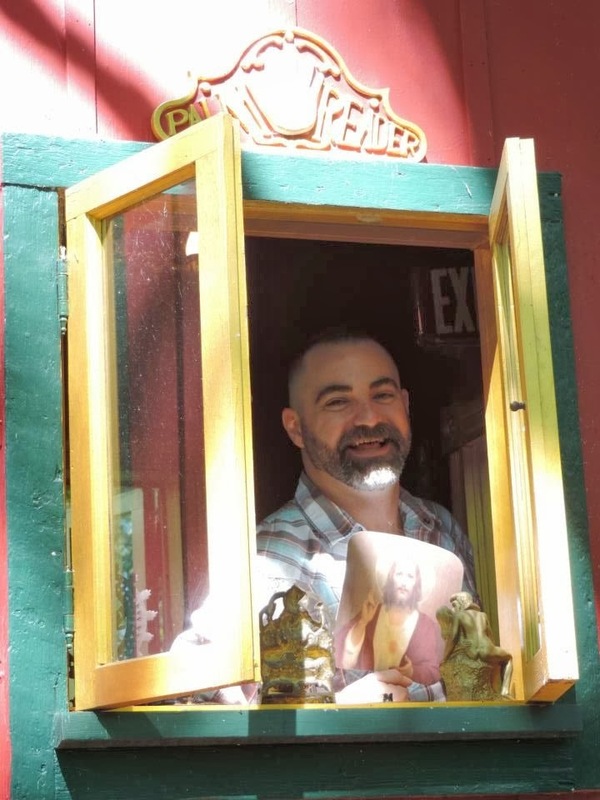 Eddy was raised Catholic, but because he was gay, it led him to question the Church’s teachings and his calling in the world. During his teenage years, he became interested in Wicca, and he began studies with the Druidic Craft of the Wise, American Rite at age 18. Eddy studied, then mentored, and proceeded to rise in rank to a place where he would teach his own initiates. His specialties were astrology and divination, and he taught many classes on these subjects. Eddy was the youngest priest ever to be initiated in his chapter. In 2004, he was elevated to the High Priesthood, and he maintained that position until 2009. Eddy was also drawn to other spiritual paths that celebrated men who love men, such as the Minoan Brotherhood, and he participated in many of their rituals. During the 1990s, Eddy decided to explore his Cuban roots. Like many first-generation Cuban-Americans, he had set them aside, in favor of more mainstream social and spiritual paths. As part of this search, he received initiation in 2001 into Santeria Lucumi, a Cuban form of the Yoruba Lucumi religion practiced in Africa. Eddy was initiated as a priest of Shango, the orisha of male power and strength. In order to officiate as a priest, Eddy studied the Yoruba language, and perfected his skills as a diviner with a well-known Lucumi teacher, Ochani Lele. This complex system uses cowrie shells, and requires a reader to memorize 256 separate stories that can be applied to a client’s situation. But this wasn’t the only way that Eddy knew how to divine for his clients. In addition to reading the diloggun, Eddy was a traditional Tarot card reader, an astrologer, a scryer, a bone caster, a geomancer, and a psychometrist. His ability to help others see what they needed to see, in an open and honest way, opened roads and comforted and educated many. Eddy also became interested in African-American folk magic. He was trying to understand how the African cultural and spiritual experience had been retained among the descendants of slaves, and how that experience differed for people whose families had ended up in Cuba or in the United States. 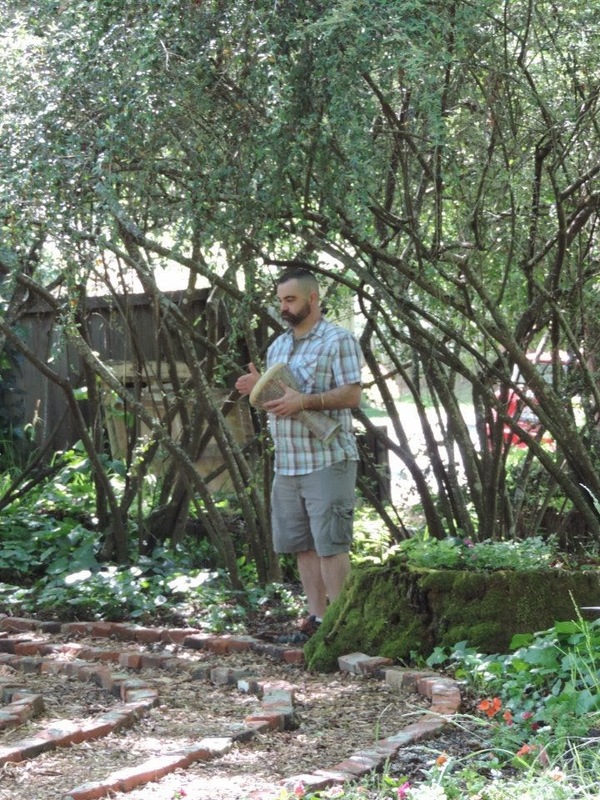 To take his interest further, Eddy enrolled in catherine yronwode's Hoodoo Rootwork Correspondence Course, and upon his graduation in 2008, Eddy embarked on a career as a root and conjure doctor serving clients in Southern California and via the internet. This developing career led him to join the Association of Independent Readers and Rootworkers (or AIRR), and to manufacture his own line of spiritual supplies under the name Dr. E. Products. 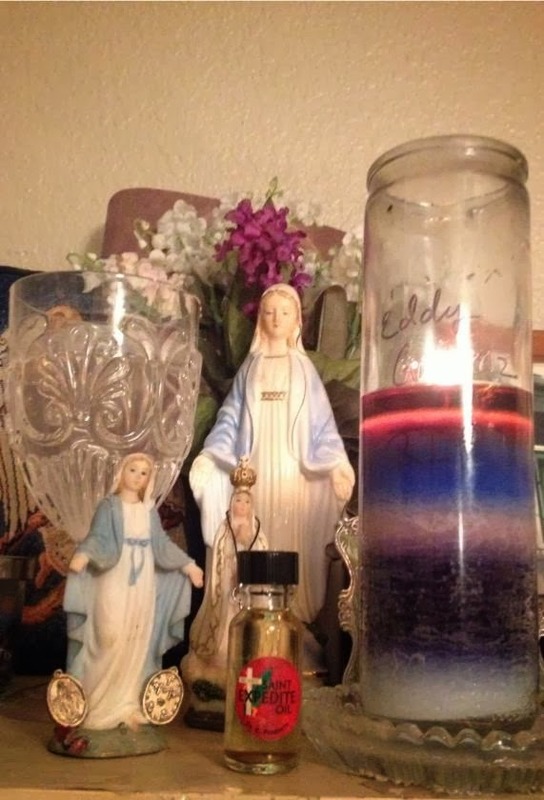 Eddy joined and helped develop the Hoodoo Psychics, a telephone-based divination service offering spellcasting advice as well as readings. 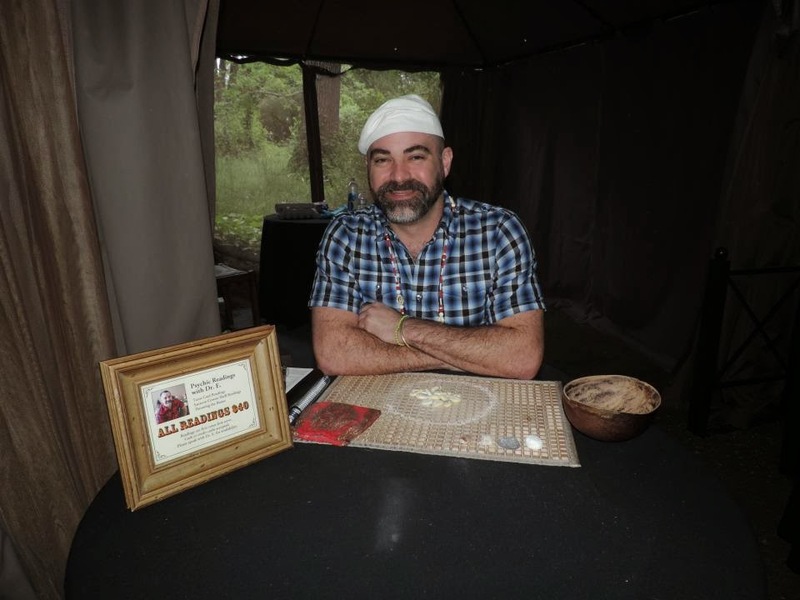 He also was a frequent guest and fill-in co-host on the Lucky Mojo Hoodoo Rootwork Hour, a weekly Blog Talk Radio program where a panel of 3 conjure practitioners provides guidance and prescribes rootwork spells and techniques to help call-in clients with their issues. Eddy remained a dynamic, colorful speaker, and a consummate teacher, long after his high school days with the Toastmasters and the Debate Club. He was a renaissance man in the truest sense of the word. 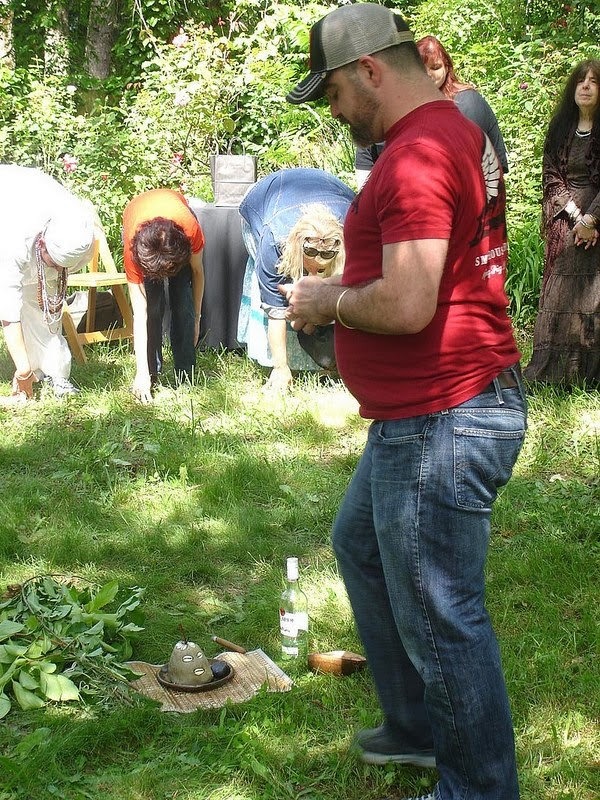 In addition to PantheaCon presentations and teachings he offered to his Wiccan students and his students in the Unnamed Path, Eddy offered annual presentations at the Hoodoo Heritage Festival, was a yearly presenter at El Camino College on alternative spiritual practices, and traveled around the country giving classes, conducting rituals, and helping people wherever he went. He was a loyal member of the AIRR Tech Team, and committed to writing new webpages about magic and spirituality every week. He had just begun to participate in the 2014 Pagan Blog Project, was managing numerous websites, and had been working on a series of Unnamed Path books, and at least two other books, at the time of his death. Embodying (and often wearing!) the color of his orisha Shango, bright red, Eddy was an energetic, yet down-to-earth leader, who contributed to many Pagan, Santeria, and hoodoo gatherings from the ground up, offering all of his skills from his various spiritual talents to his more mainstream design and IT skills freely for their success. 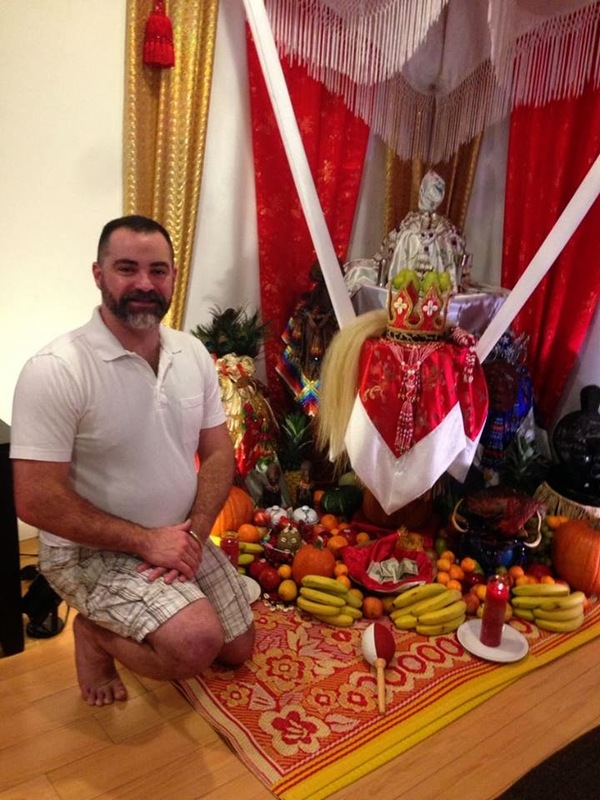 By 2011, Eddy was able to quit his corporate job and devote himself full-time to his online shop and candle ministry at the Santeria Church of the Orishas he also founded. Eddy was an honorable, ethical man, especially when it came to spiritual matters. As part of the church’s outreach program, Eddy developed the Santeros Against Fraud and Exploitation (or SAFE) blog, where he drew attention to people who were appropriating elements of African Traditional Religions, as well as fraudulent or disreputable people who exploit the religion to make money, or to gain power and control over innocent spiritual seekers. His critiques were always on point; he never attacked anyone personally, and laid out his arguments thoughtfully and flawlessly. It is a testament to just how fair he was able to be, that even some of the people that Eddy criticized or exposed in his work, have expressed sincere condolence for a person that they did not agree with, but could not fail to respect. You might think that Eddy was a hard worker, or that he was driven and serious, and there is no doubt that he was all of these things. His side eye was legendary; he did not suffer fools lightly, and he had no patience or tolerance for liars or cheaters. And yet, there was a light-hearted and fun side to Eddy as well. He loved to go to Disneyland, and to show visitors the occult, witchy side of Southern California. His sense of humor was renowned and his quick wit made every occasion special. The games of Cards Against Humanity he held with friends and family alike were legendary, both for their humor, and their ability to use that humor to bring people together, whether for a little mischief, or just for a good, shared laugh. He delighted in social media, sharing jokes and YouTube videos alongside teachings, using the Internet to bring even more people into his ever-growing circle of family and friends. 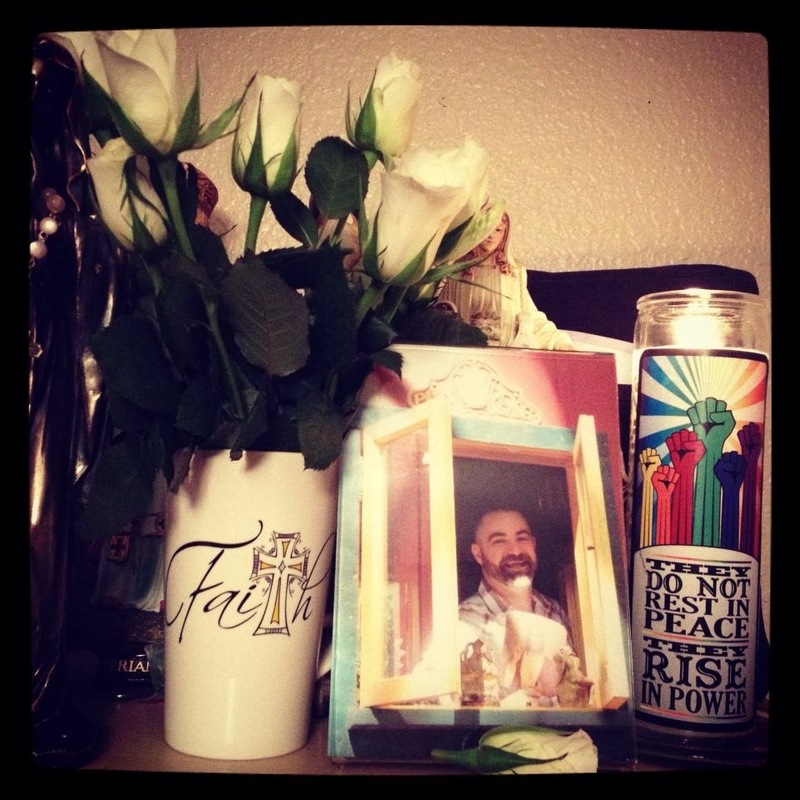 Eddy was not only a dedicated teacher and an impeccable priest. He was a loving son, a devoted brother, a proud uncle, and a loyal friend. Eddy’s partner, Clayton James Pfingston, was the love of his life. You may notice that in many of the photos of them together, Clayton is usually standing to Eddy’s left — which makes Eddy Clayton’s right hand man. They lifted each other up, and in doing so, their love was a powerful example to others. Their cats, Hedwig and Sid, completed their happy family, and tended to show up in family photos. Eddy was very proud of his family, and adored his nephew, Jordan. On a list of personal goals he had set out for himself to complete in 2014, Eddy intended to bring his mother into his business, after she retired from her day job, so that she would be taken care of. His next goal after that was to marry Clayton. Eddy's death was unexpected. He died young, in the middle of an expanding career, and leaving behind many people whose lives have been touched by the love he shared. And yet he packed an entire lifetime into the 38 years he was given. Eddy had been scheduled to make presentations at PantheaCon next month, and the Hoodoo Heritage Festival in the spring, and he had planned to publish one of the two books he was working on in the Fall of 2014. As a testament to Eddy’s aspirations, and to the love, loyalty, and drive he inspired in everyone he met, both venues have scheduled memorial tributes to him, and his friends are hoping to bring his work to publication posthumously. We will never have another Eddy Gutierrez in our lives on this side of the sunrise, but we can have faith that he will continue to be present, to teach, to connect, and to inspire us. May he “RISE IN POWER” among the spirits. We love you Eddy! Another touching eulogy of sorts came across my Facebook feed that I felt should be shared. It is a beautiful tribute to a side of Dr. E most females would never know. At the Queer Conjure Colloquium held at last year's Hoodoo Heritage Festival my friend Eddy Gutiérrez said something so profound and filled with Truth that stirred it me on a deep level. 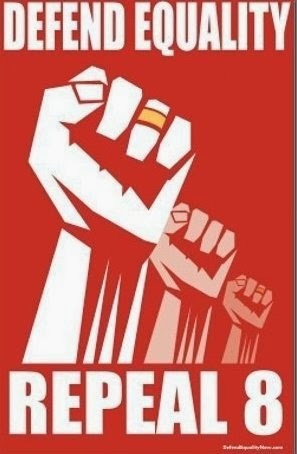 When speaking about the Queer Ancestors he used the phrase "They Do Not Rest In Peace - They Rise In Power!" This Truth inspired me to create the candle that you see on the left of his picture. It was my intention to mail him this candle as a gift of thanks for bringing it into my life, but I never got around to doing it. 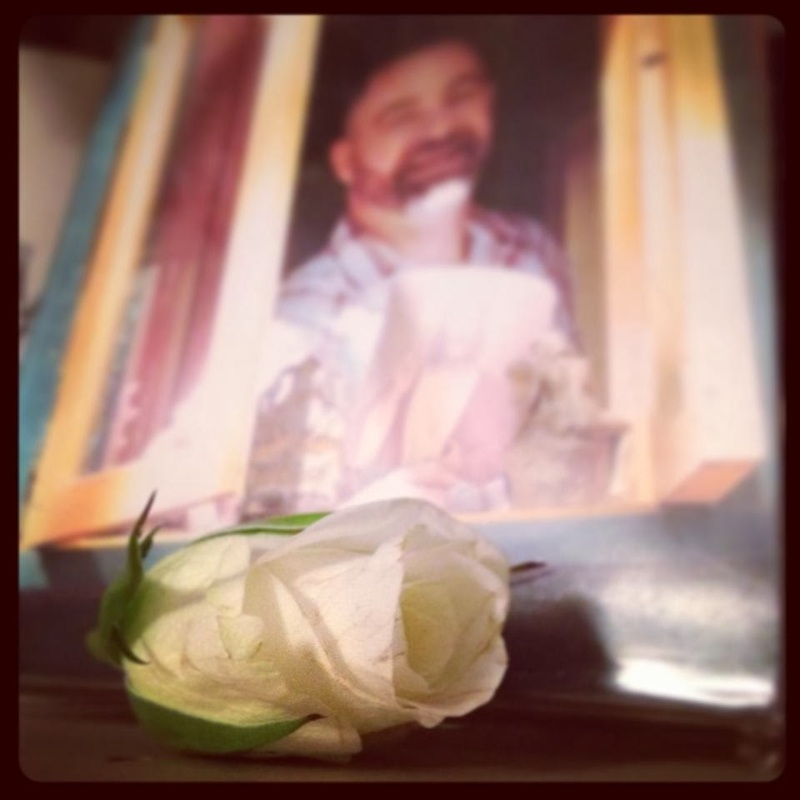 I never would have believed that today I would be lighting this candle for him. Rest well my friend - we know that your power will rise! I was so touched and moved by his status update and the candle that he created for Dr. E, that I asked him to make me one too. 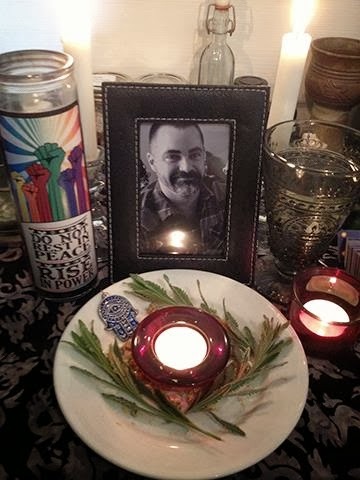 So tonight, I will make a permanent place on my Altar to honor my Teacher, my colleague, one of my biggest "cheerleaders", my Friend. I miss you Dr.E.... more than words can say. I can't believe you are gone, that I won't see you upon this earth again. I am thankful for the many archived sources of your teachings, photographs, and of your loved ones still presently here that will continue to keep everything about you alive. If I can be a part of that legacy, I will be happy to do so. Before I conclude this blog post on my dear friend Dr. E, I want to share with you just how incredible this man is. 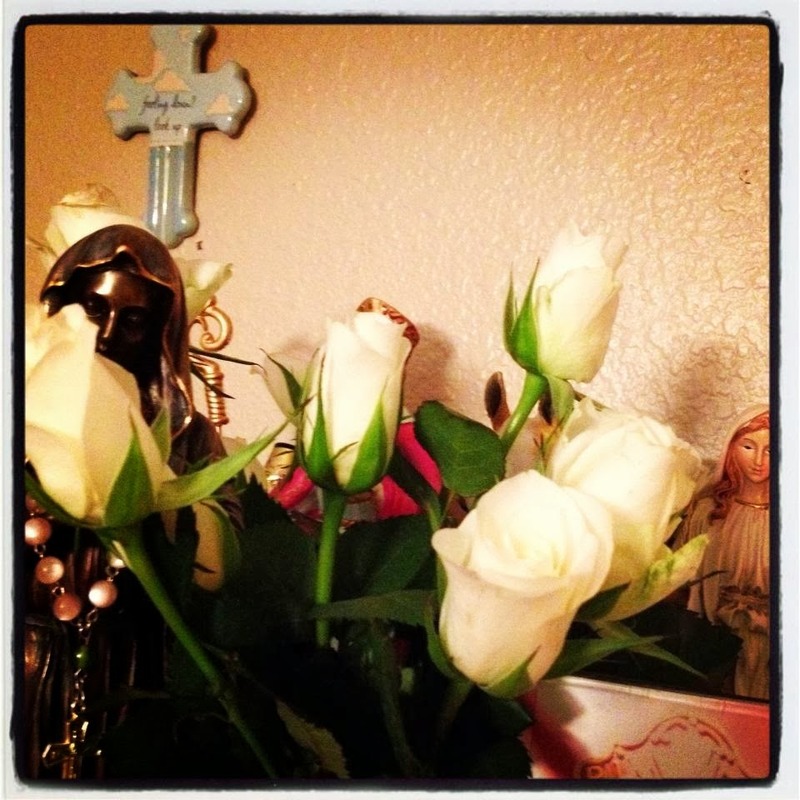 All night last night I was belly aching over getting The Perfect white roses for the funeral. And as my luck would have it, I hit all the local florists in the area right after they closed *Grr* so I had to rely on the internet and God above to help deliver what I wanted to send. My initial choice was not available in the time frame that I had requested it by, nor was it what I had my heart set on, but it was beautiful. OK... so I did end up getting what I wanted sent after all! Yay! 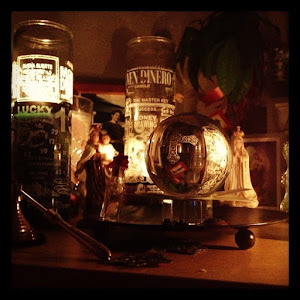 Still wanting to do something to honor Dr. E personally, I went about gathering some things up and making him a space amongst my loved ones on my Ancestor Altar. As I was getting his photo printed, I glanced around the store and saw a floral section. Wouldn't you know, as luck would have it, there it was.... 1 lone bouquet of white roses. Not just any white roses.... African White Roses! I thought of E right away... He representing the Lucumi Religion and all. I knew that was him giving me that "spiritual tap on the shoulder" knowing that was exactly what I was looking for. 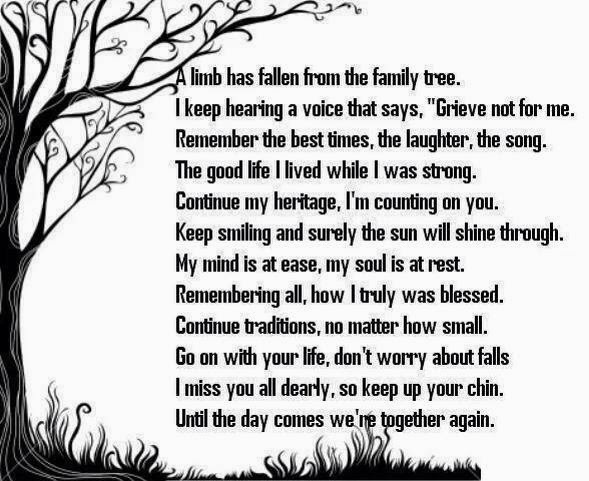 Know that you were dearly loved, will be missed by many. The nights sky just got quite a bit brighter as they gained a star. This candle is for you. As you will probably have noticed, this issue of the Lucky Mojo Newsletter is about three weeks late. 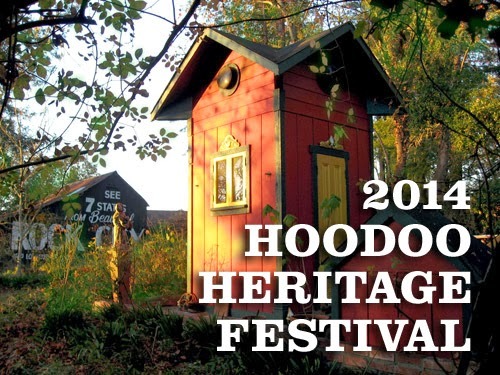 We knew it was going to be a little late, because we wanted to get you a full and complete schedule of the Hoodoo Heritage Festival program scheduled for May 3-4, but on January 14, the very day the web page was to be finalized and the tickets were to go on sale, we got the terrible news that our dear friend and colleague Eddy Gutierrez, better known as Dr. E., had passed suddenly due to a massive heart attack. We have been devasted by the loss of our friend, and in deep sorrow for the pain his death has brought to his mother Vicky Sirgo Gutierrez, affectionately known as Momma E., and to his partner Clayton James, whose companionship and support gave beauty and meaning to his life. Eddy's death came only a couple of hours after he had been cheerfully working on the web page for the Festival, designing a postcard mailer, and writing paragraphs about the presenters and their classes. He was going to get the ticketing set up, and then the newsletter would go out, before midnight. Needless to say, we have spent the past week scrambling to try to cover all of the details he was handling, and we had to call in a small village of helpers to accomplish what the awesomely talented and skilled Eddy could have done in a few hours. 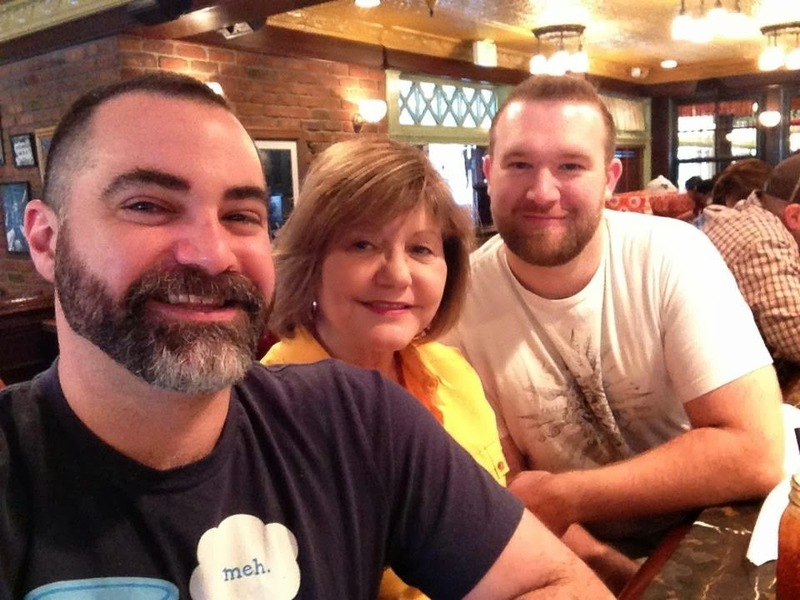 A friend, teacher, and guiding light passes. It is with profound regret that we announce the passing away of our beloved Dr. E.
Eduardo "Eddy" Gutiérrez, Dr. E. Ekun Dayo, Reverend Hyperion, of Glendale California, passed away on January 14th at the USC Verdugo Hills Hospital after suffering a cardiac event. He is survived by his loving partner Clayton James, and his dear mother Vicky. He was the founder of the Unnamed Path, a shamanic path for men-who-love-men, a graduate of the Hoodoo Rootwork Correspondence Course, a Member of AIRR (the Association of Independent Readers and Rootworkers), and a respected worker in his own right. He was also the founder of the Stone and Stang gathering, and The Unnamed Path podcast, and was a regular guest on the Lucky Mojo Hoodoo Rootwork Hour radio show. An initiated Wiccan High Priest, he was also an initiate of Santeria and a Priest of Shango. Those are the facts, but facts do not sum up a person, or a life. Facts are but placeholders on the tablet of life; margins in which to write the quick, basic overview. A life is bigger than simple facts, and Dr. E.'s life was bigger still. So often when a beloved person dies we canonize them on the spot and play only to their goodness, their nobility, and their strengths. But, with Dr. E. it is impossible to not be staggered by his goodness, his nobility, and his strengths. The space here is simply not big enough to even begin to outline the margins of facts that were Eduardo Gutiérrez. I can tell you that Eddy was born on January 1st, 1976 to Cuban immigrants Manuel and Vicky Sirgo Gutiérrez. Or, that he was an incredibly talented artist and gifted choral singer. That he was the youngest Priest ever to be initiated in his chapter of the Druidic Craft of the Wise, at age 18. I can tell you that he learned the Yoruba language on his own and studied diloggun divination with the great teacher Ochani Lele. Or, that he was a skilled astrologer, bone reader, geomancer, card reader, workshop presenter, rootworker, altar maker, designer, and typesetter ... the list could go on off the page and through the margins. But, all those things are within the margins, within the page. What I cannot capture for you was his light. Not mere presence or force of ego, no, Eddy had a light. 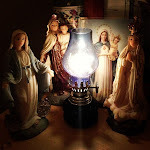 It was a light that he used to heal, to help, to discipline, and to guide. He shared it freely, joyfully, with the world and in doing so made the lives of all those who encountered him brighter, richer, and fuller. That cannot be contained inside the margins. I can tell you that he was a Capricorn, a member of the AIRR Tech Team, who contributed many tireless hours to the betterment of the AIRR site; that he participated in the Pagan Blog Project; managed numerous websites, including his own Dr. E. Products web store; and was working on two books at the time of his death. Those things fit well within the margins. But Eddy had a humor that was infectious and strong, wickedly sharp when used against the unrighteous and warm as honey when entertaining those he adored. 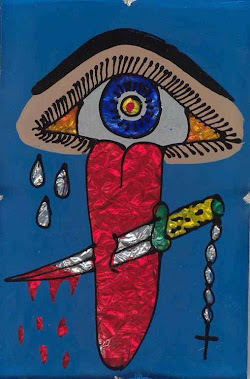 He had an integrity that did not allow him to suffer liars, scam artists, abusers, or con-artists within any of his occult, metaphysical, and religious communities. He fought against them with passion and righteousness and in doing so he made more than his fair share of enemies and saved the spirits of many. That cannot be contained within the margins. In the end I cannot sum up Eddy Gutiérrez within the simple margins that outline the page. I can only say that he was my friend, our friend, and that we all too sharply feel absence of his light, his humor, and his integrity. In the end I know that Eddy entered his house justified ... and that makes the margins large indeed. The Apprenticeship Program in April and May (see below) is our regularyearly program, but we have a number of employees in the shop waiting to take the WEEK THREE Apprenticeship. If you are a graduate of my Hoodoo Rootwork Correspondence Course and live locally or can make it up to Forestville for FIVE DAYS from APRIL 28 - MAY 2, 2014, you can join us and get in on this FREE training program along with the employees. The same rules apply as for the regular April-May Apprenticeship, but this will be WEEK THREE. The program is FREE to Hoodoo Rootwork Correspondence Course graduates, but you must call Heidi Simpson at the shop to arrange your attendance. The number is 707-887-1521. Heidi is there Mondays through Fridays. 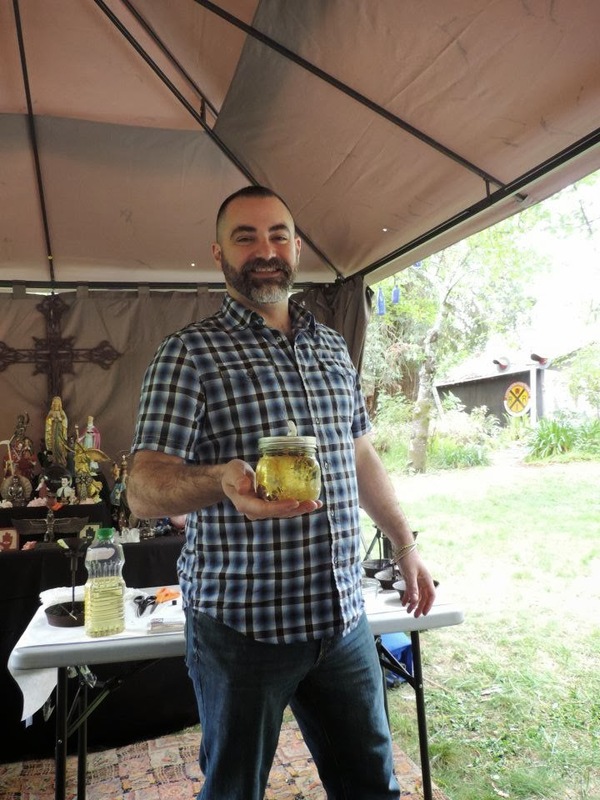 For the seventh consecutive year, Missionary Independent Spiritual Churchis sponsoring our Hoodoo Heritage Festival in Forestville, California. This program is OPEN TO THE PUBLIC. 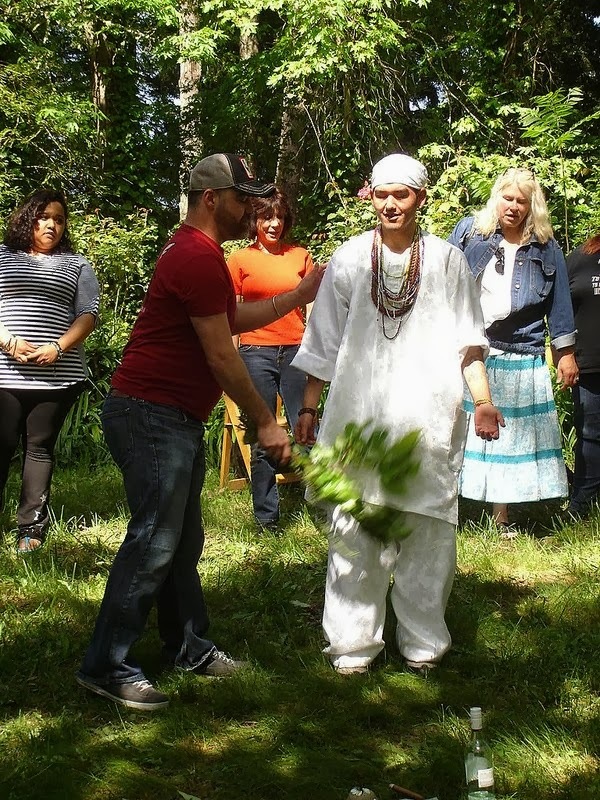 You do not need to be a student of the Hoodoo Rootwork Correspondence Course or a Graduate Apprentice to come out to the program and learn conjure for two fabulous days in Forestville! Everyone is welcome, and every year people come from all across the country and all around the world to take these fun, fast-moving, hands-on workshops. These classes in African American folk magic, rootwork, and hoodoo will teach you practical tricks and tips to take your conjure work to a new level of confidence and knowledge. In addition to spell casting, we also showcase the mystery and magic of world-wide folk religions. And, above all, the Hoodoo Heritage Festival is a not-for-profit venture -- so, in addition to great teaching, you will receive goodie bags from our sponsors that are filled with freebies galore. Your ticket covers everything but your lodging -- you will go home with instructional flyers, advance copies of brand new books, and spiritual supplies from Lucky Mojo -- plus, Missionary Independent Spiritual Church sets out a generous supply of food and drinks, so there are no hidden meal costs for attendees. Registration for classes begins during the month of JANUARY, 2014. Pre-payment is by Paypal through Eventbrite ticketing services. We encourage folks to sign up well ahead of the event. Make your travel plans now to attend this unique 2-Day Festival of Hoodoo Heritage, African American Folk Magic, and Spiritual Spell-Casting! The Lenormand deck #1941 by Ferd. Piatnik & Sohne. The Vacant Chair: A Tribute to Dr. E.
Special Guest Readers and Rootworkers from AIRR, the Association of Independent Readers and Rootworkers, will be featured on January 5, 12, 19, and 26, 2014. Tune in and see who's up! 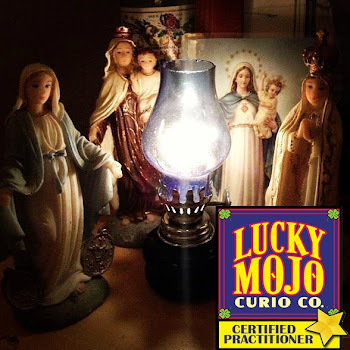 To get a FREE reading and rootwork advice, you must pre-register at theLucky Mojo Forum, then call in by telephone during that week's LIVE broadcast and press '1' to request to be on the air. I apologize again for the lateness of this newsletter. The death of Dr. E. has brought us great sorrow and also substantial chaos, as he has been integral to the planning of the Hoodoo Heritage Festival every year since he began to attend, and without him, we are left to carry many loads he had previously shouldered during the behind-the-scenes preparations for our programs. My thanks go out to all those i have called upon to carry us this far: Chas Bogan and Storm Faerywolf of The Mystic Dream, Grey Wolf of The Sacred Well, Marcus Cook, Madame Nadia, Deacon Millett of Hoodoo Psychics and Four Altars, ConjureMan Ali, Professor Charles Porterfield, Leah Rivera, Michele Jackson, and nagasiva yronwode. Thank you, friends. I am sure i will be asking more of you in the weeks to come, as we traverse this difficult moment in time and emerge into the sunlight once again. Services for Dr. E will be held tomorrow in Garden Grove, Ca. celebrating the life of a truly one of a kind human being, one who will live in our hearts and memories forever. January 14, 2014 the conjure world felt a great loss with the passing of Dr.E. Dr. E succumbed to a major heart attack at the age of 38; too young.. too soon. I did not know too much of his life serving in the Lucumi religion, but knew him more on a personal level and practicing as a Root Worker. 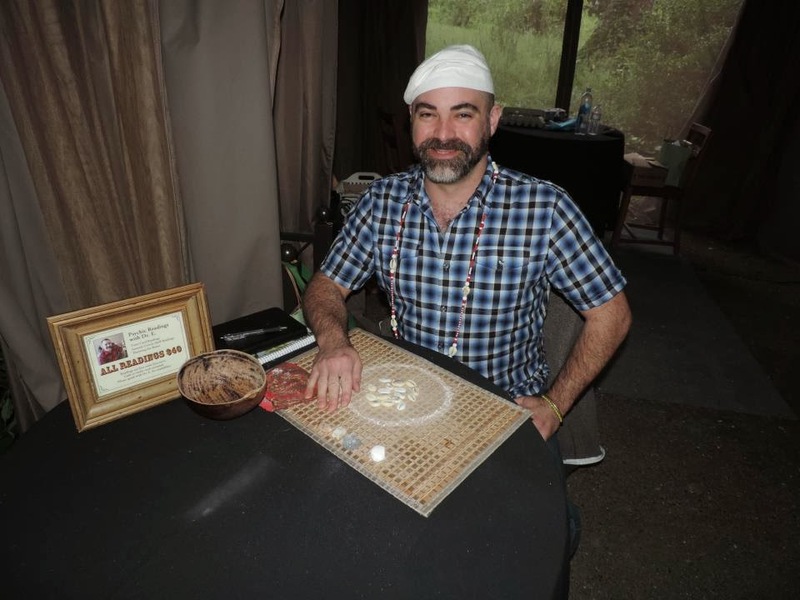 I first met him at the 2012 Missionary Independent Spiritual Church Hoodoo Rootwork Workshops where he led the Road Opening Ceremony working with Ellegua. I didn't have too much interaction with him that first year of meeting him; I must admit I felt a tad intimidated by him, which now I see that he was anything but. I had a much closer relationship with Dr.E in 2013, at PantheaCon. I consulted him on a few cases I was working on where he was more than happy to help me fine tune my workings as well as customizing some spell work in order to give me the best results possible. He was not shy about telling me the truth on some things. The harsh reality that there are things that conjure just can't touch. I loved the fact that he pulled no punches, no false promises, no "sugar coating" a lie. But took the opportunity to explain and show to you that even tragedy's have their silver linings.... That in death there is re-birth. 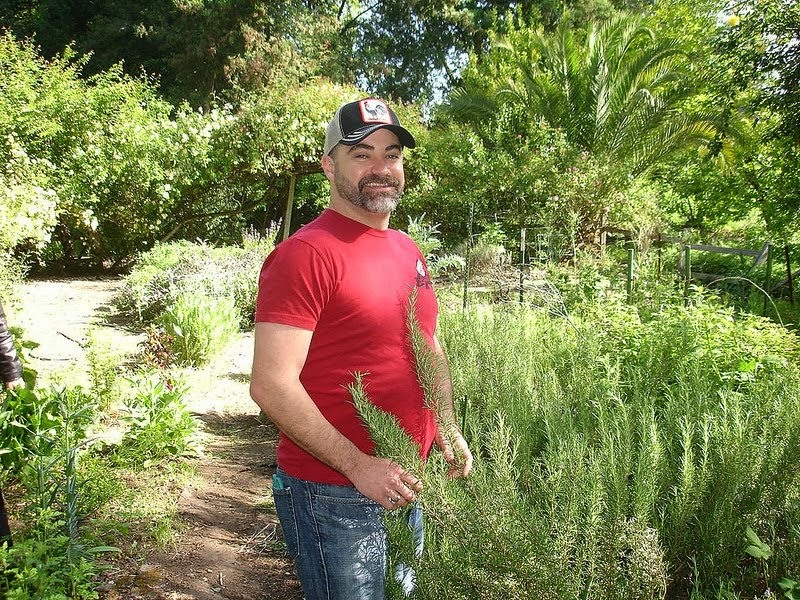 Collecting herbs at the Lucky Mojo Curio Co.
We kept in touch via email and Facebook, as well as tuning into the various BlogTalk Radio shows that he would be featured on to listen and learn. Dr. E was an amazing and charismatic Teacher. I always looked forward to taking his classes at the workshop weekend at LMCC as there was always something new to learn from him. He had an amazing gift of knowledge (seriously... there isn't much this man didn't know) as well as how to engage people. His sense of humor, this is what I will miss about him the most. While I am still incredibly sad over the passing of this extremely talented man, I am also very proud to be a part of a community that is honoring Dr.E so passionately. 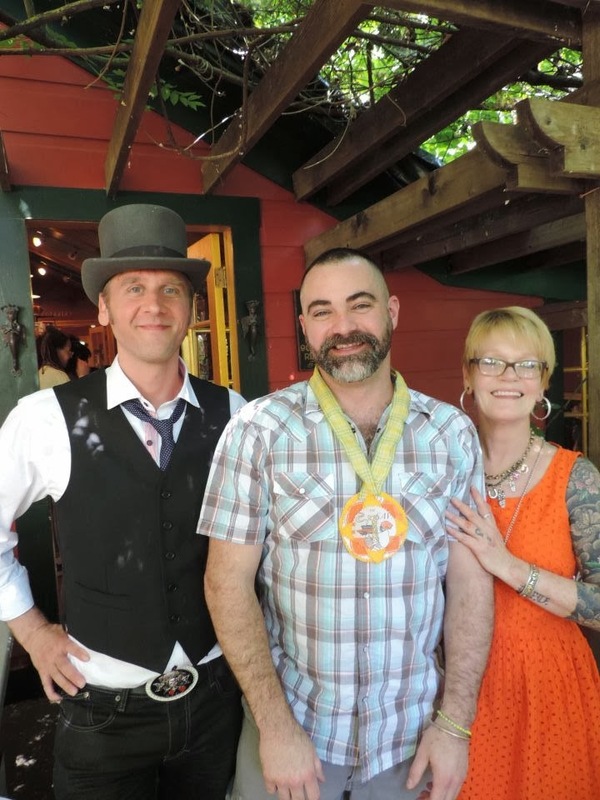 Hougan Matt of Good Luck - A Kansas City Conjure Shop set up a Memorial Fund in Dr.E's honor to help offset the impending medical and funeral costs. I have to say I am beyond impressed with the outpouring of monetary gifts as well as messages left for Dr.E's family in this emotionally tough time. Let's honor Dr. E in the way he deserves. He served all that knew him, that loved him. It's time to return the favor. While the world, the community, family, and friends of Dr. E mourn the loss of a legend, his Ancestors and Heaven just gained one. I am beyond blessed and fortunate that I knew Dr. E personally and professionally, and to have been able to share a brief part of his life too. A beautiful human being whom I will never forget. PantheaCon and the Workshops at LMCC will definitely be hard to attend knowing that I won't be seeing much less photographing that smiling face again... I will go because I know he wouldn't want anyone stopping their life just because he was no longer in it. Thank You Dr. E .... Thank You for being you, Thank You for all your help, Thank You for your kindness, Thank You for your wisdom. Thank You for making me a better conjure worker. Thank You for making me a better person. And I would also like to give a BIG Thank You to "Momma E" and Clayton. Thank You both for sharing this extraordinary man with us all. Rest in Peace my dear friend.. I will see you on the other side.